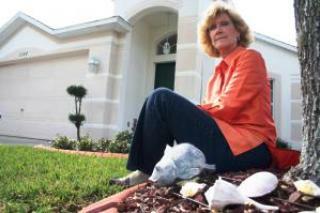 LAKEWOOD RANCH — Within days, Summerfield resident Joani Ellis should know whether the $1,600 fine levied against her for having too many decorations in her front yard will be enforced. Pictures from a decade ago show Ellis’ yard in virtually the same condition as today. The same decorative fish and seashell combination rests beneath a tree in her front yard as well as adjacent to the garage. Two metal poodles sculptures stand amid a flower bed and three pots filled with flowering plants, dot another section of the flowerbed where vegetation will not grow. Joani Ellis says deed restrictions are being enforced selectively in her neighborhood. limited to three in quantity. Ellis has been cited for having 22 items in her yard. Property management personnel are counting each individual shell as one decorative item, even though a metal frame connects them. Her $1,600 fine is one that she’s had since late 2006, when she first received notice of the violation. At the time, Ellis requested to be heard by the HOA board but was denied. Town Hall stopped fining her after receiving a notice from her attorney in late 2006, but the charges never were dropped. “I have not paid it because of the statute of limitations and also because of selective enforcement,” Ellis said. Since the first letter Ellis received about her decorations, she has scoured the neighborhood, looking for similar violations to see if she’s been singled out or if the rule has been enforced consistently. A few of her neighbors have even adorned their yards with extra decorative items to see if they’d receive notices, which they never did. Ellis pulls up a picture of a beautifully landscaped home — one whose owners obviously spent more than a few hundred dollars on landscaping. And yet it violates the three-item rule. Even the yards of current HOA board and committee members and community development district supervisors contained the same violation, as evidenced by Ellis’ pictures and confirmed by The East County Observer, which stopped by several homes to verify the offenses. “I have thousands of pictures of hundreds of home that have the same or more infractions than I on the same subject,” Ellis said. And the fact that Ellis was elected to serve on a neighborhood committee in 2007 — with the same infractions hanging over her head — also seems to show the rules are being enforced selectively. This year, when Ellis again ran for a neighborhood committee seat, she received enough votes to hold the position but was informed later she could not serve because she was not a “member in good standing” because of her yard, she said. Ellis isn’t alone in her concerns about enforcement. Neighbor Pam Brown said she received a notice in February 2009 about a trellis in her front yard that needed to be removed or approved by the modifications committee. Brown said the confusion about the trellis wasn’t limited to this incident and that HOA records on her yard are incorrect. One woman who lives in The Country Club and has a relative in Greenbrook agreed to speak with The East County Observer on the condition of anonymity for fear of retaliation for speaking out on the subject. She also noted some rules — such as one that restricts overnight parking on the streets — are not always realistic. In a rental situation, for example, two adults are allowed per each room and one is allowed in the den. In a three-bedroom home with a den that could translate to up to seven vehicles for a two-car garage with two parking spaces. Or, if a homeowner has several relatives in town for a few weeks, they likely would have to violate the rule. Additionally, homeowners can report others anonymously. The policy is meant to help the community, but the woman and Brown said it pits neighbors against one another. Because complaints are received anonymously, homeowners in violation cannot learn who reported them. The woman from Country Club feels if a violation is reported numerous times — or by the same person against the same homeowner — the legitimacy of the complaint should be questioned and the complainant should be revealed. Town Hall’s property management staff, she said, have a responsibility not only to make sure the complaint does reveal a violation of deed restrictions, but also to visit that neighborhood and look for other violations so that no one home is being targeted. Community Associations Manager Cynthia Wills did not return repeated phone calls left by the Observer seeking comment for this article or for information about how the property management department handles deed restriction enforcement. Wills also escorted a staff member of The East County Observer from Ellis’ compliance meeting Feb. 8, citing the meeting was open only to Summerfield/Riverwalk homeowners. Other attendees of the meeting, including one woman who lives in Palmer Ranch in Sarasota, were not asked to leave. Ellis is determined something should change and hopes the SRVA board sees a bigger picture. “Our neighborhood has matured and it is time to rewrite the rules to help maintain our property values and the integrity of the neighborhood, not just list a number of items that can be displayed,” she said. Ellis said regardless of the outcome of her compliance hearing, she plans to lobby the rule revision committee to reevaluate rules in the neighborhood. She also said she is hopeful the SRVA compliance committee will cast a favorable decision her way, but she is ready to take the issue to court — if necessary — if the board denies her request.